Everyone at St Margaretsbury will be ecstatic at their haul of seven points from their first nine on offer in 2018 following a 0-3 win at London Tigers, a highly entertaining 0-0 draw at relegation rival's Stotfold last Tuesday and an amazing 1-0 home win against title challenger's Berkhamsted on Saturday. It pulls them away from the Spartan South Midlands League Premier Division bottom two. 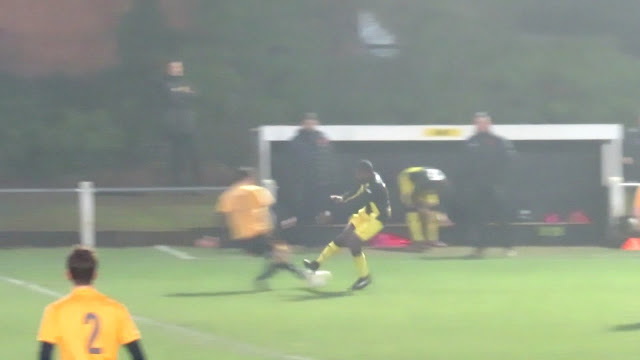 Highlights of the game versus Stotfold are below in which there were three red cards. The first saw Ahmed Mohammed dismissed for a straight red in the first half which looking at the replay was entirely the correct decision by the match officials. There didn't seem anything malicious in the challenge but it was a stud's up dangerous tackle that could of seriously injured the Stotfold player. The match was an even encounter with away keeper Adam Seymour making some really good saves to keep a well deserved clean sheet - his one handed stop in the second half deserves a particular mention. Late on in the game Tom Cowell (St Mag's sub) and Charlie Briggs of Stotfold clashed off the ball and were both sent off. Stotfold are bottom of the table and are now, following their 4-3 defeat at London Colney on Saturday, without a win in four league games. All is to play for though with many points up for grabs between now and the end of the season. Meanwhile at the top of the division there has been some twists and turns over the last couple of games played indicated in Berkhamsted's defeat to St Margaretsbury. This was The Comrades first league defeat of the season - Their title rivals overtook them at the top of the table on Saturday but they swapped places again on Tuesday evening when Biggleswade United won 3-2 against The Citizens (which was their first defeat of the season) and Berkhamsted won comfortably 4-0 at home to Hadley. The race for the title looks set to be an exciting one - Some people may rate Welwyn as favourites (just!) with the three games in hand they currently have. The two title rivals face each other three times within the next month beginning next Wednesday in the Herts FA Charity Shield Semi-Final (the other semi-final is between FC Broxbourne Borough and Colney Heath) which will be a dress rehersal for the two highly important league games coming up in February. One at Broadwater on Saturday 3rd February and the return on Valentines Night at Herns Way!